Here's me next to Princess Knight, one of Osamu Tezuka's famous manga characters (you might also be familiar with his other comic heroes, Astro Boy and Kimba the White Lion). I'm particularly fond of Princess Knight because her story is about being raised as a boy because a girl cannot take the throne. So she must act one way, and deal with the conflict in her heart at times. 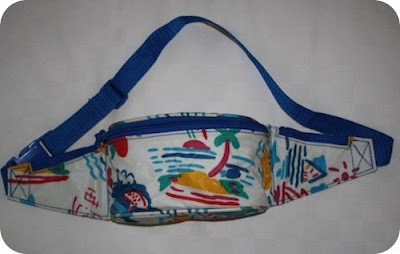 I like the metaphor because it proved only too useful today, as I wore my Ken Done 'fanny-pack' or 'bum-bag' if you prefer (neither descriptor is that *good* is it, really?!). Things here are not quite as they seem because I'm pretty sure this travelling bag is a fake Ken Done. 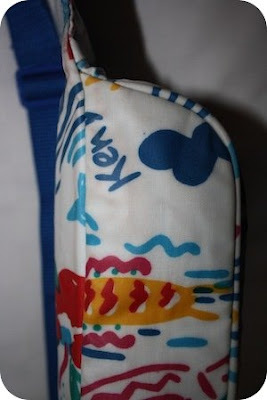 When I bought it I thought it was genuine, but look at the beginning of the 'Ken' signature on the bottom of the bag. An imitation, methinks. But what's so bad about an imitation? And when does an 'imitation' do as good a job, or better than the 'real' thing? Princess Knight is a real hero in her own story. 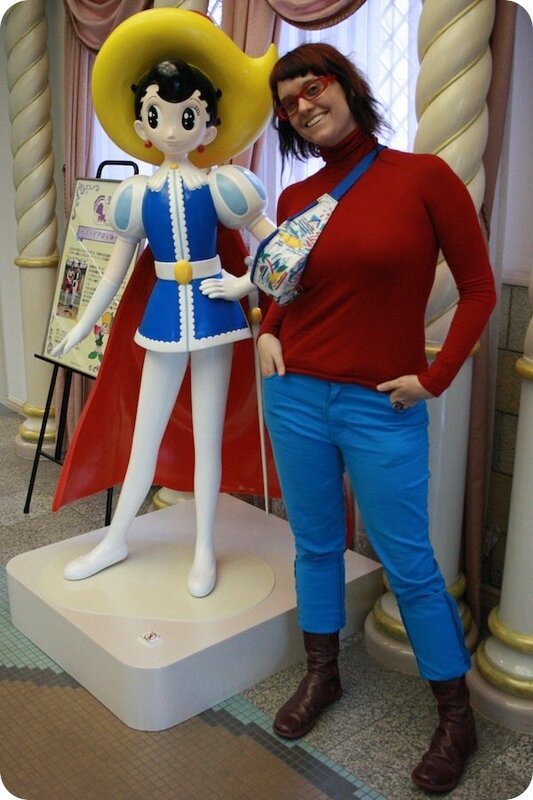 And I was *super excited* when I found out that the Osamu Tezuka Manga Museum was in Takarazuka. Why? 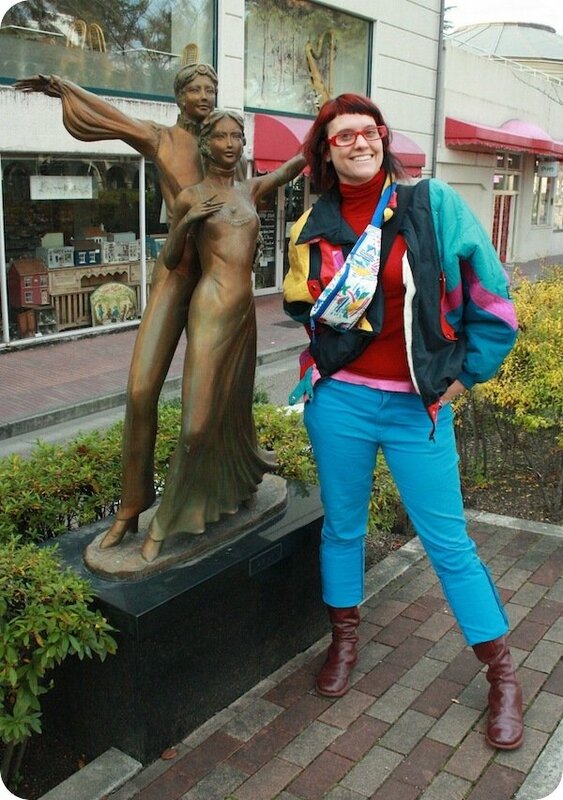 Because this town is also famous for the very popular Takarazuka Revue too. The Revue is well-known for an inversion of the well-known Japanese Kabuki theatre: in the Takarazuka women play all the parts, including male leads. Plus the theatre pieces are often homages to Hollywood type musicals, so the costumes are gaudy, camp and exciting all at the same time (see: kind of like Ken Done fashion too?!) Below I'm posing with one of the statues in the town commemorating the fine Takarazuka tradition. And finally, you'll get to see more of it, but I can't tell you how happy I am to be wearing this 1980s ski jacket that I found in a Frankston op-shop. The label says, 'Gear by Margot' and it is truly 80s gold. I'll unveil all its *goodness* over my trip, but to start with, look at the inside of the jacket: it has it's own sign-posted sunglasses holder. 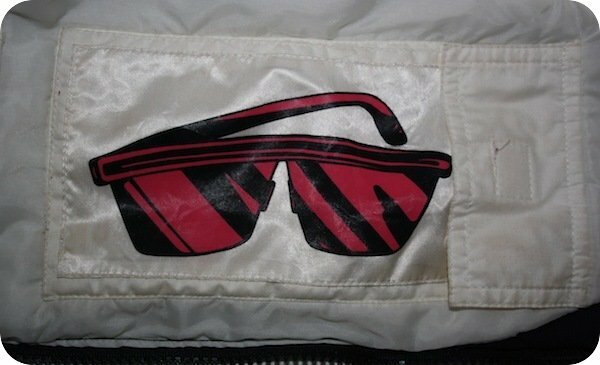 Now if only I had sunglasses like these, I'd give the Takarazuka Revue some camp competition! I love the Takarazuka Ladies. Will you be dressing like one?